And then I am delighted to introduce you to someone new to Jungle Red, Sheila Webster Boneham, who writes the "Animals in Focus" mystery series. How could I resist an author with an Aussie on her book cover and in her author photo? Welcome Sheila! SHEILA WEBSTER BONEHAM: Setting is an essential element of many works of fiction. Some settings are important enough to be regarded as "characters" of a sort – Tony Hillerman’s Four Corners area of the Southwest, for instance, or Carl Hiassen’s Florida – and the players and plots depend in large part on place. The stories just wouldn’t work as well anywhere else. In my own Animals in Focus mystery series, 50-something animal photographer Janet MacPhail, her Australian Shepherd Jay, and her orange tabby Leo, spend most of their time in and around Fort Wayne and other parts of northern Indiana. I chose the area partly because I grew up there and know it well, and partly because it is a beautiful part of the country that often gets short shrift from outsiders who think the whole state (or perhaps the entire Midwest?) is just flat farmland merging into the industrial landscape just east of Chicago. Indiana certainly has its share of corn and beans, hogs and factories, but the state is also rich in lakes, rivers, forests, hills, and ravines as well as bustling cities, small towns, and occasional quirky attractions. Janet’s career and her hobby—training and competing in dog and cat (yes, cat!) sports—both take her to a variety of locations, from fairgrounds to lakes and rivers to rolling pastures and wild wooded ravines. Take Janet’s stomping grounds in and around Fort Wayne. The city is set at the confluence of the St. Joseph and St. Marys rivers, which join forces to flow east and then north to Lake Erie as the Maumee. Historically, this was the site of a sprawling Miami Indian village known as Kekionga (“blackberry bush”)—my junior high school was named for the village. Modern Fort Wayne straddles the rivers, with Main Street practically running into the point where the rivers meet. This is, in fact, an area prone to flooding, and some time ago the city began buying up property along the rivers, eventually creating well-used parks that accommodate a lot of overflow from the occasional deluge. 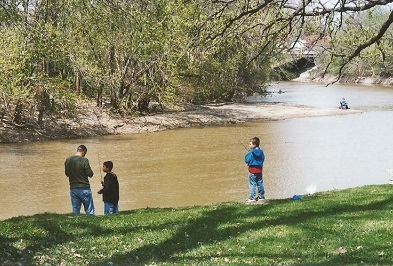 In dryer times, the parks are well used for walking, jogging, bicycling, and fishing. One of my favorite places in Fort Wayne is the Rivergreenway, a 25-mile multi-use trail along the rivers. When I lived there, I spent many a happy hour riding my bike or walking, with or without my dogs, along various sections of the trail. It’s no mystery, then, why my fictional friend Janet does the same. She and her Australian Shepherd, Jay, even wrestle with a corpse on the trail in Drop Dead on Recall (although I won’t say what kind of corpse!). A short drive north and west of Fort Wayne we find ourselves in lake country, and I can’t resist including some of the lakes and rivers in the books just for a chance to use their musical names—Maxinkuckee, Winona, Manitou, Wawasee. And of course the big lake—Michigan—with some forty miles of Indiana shoreline. Fifteen of those miles border the 15,000 acres of Indiana Dunes National Lakeshore, whose forty-five miles of trails pass through dunes, wetlands, prairies, and forests. If that’s not enough, Indiana Dunes State Park offers more opportunities to enjoy the wildlife and natural landscape of this beautiful area. I’m sure Janet will get there one of these books! 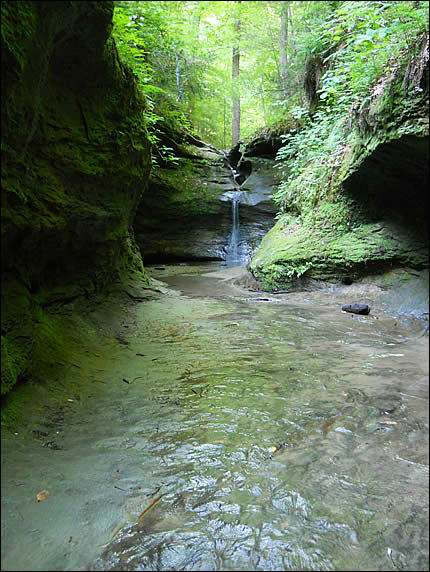 If you’re in the mood for something a more rugged, a three-hour drive to the southwest will land you in Turkey Run and Shades state parks in the west-central part of Indiana. Ancient glaciers carved deep ravines into this landscape, which is rich with gorgeous rock formations and varied flora and fauna. Shades also protects one of the last remaining virgin hardwood forests in the region. If you hike these trails, be sure to wear your slip-proof shoes or boots, and be ready for a workout, and for some gorgeous scenery and wildlife sightings. Drive farther south and you’ll find yourself in hilly country famous for its construction-quality limestone (think Empire State Building, Washington National Cathedral, Pentagon…. the list is long), the 202,000-acre Hoosier National Forest, the Indiana University campus in Bloomington, beautiful hill-country state parks like Brown County and McCormick’s Creek (which is my favorite). And as long as we’re headed south, don’t miss Clifty Falls and Falls of the Ohio, where Lewis and Clark met to begin their expedition. In the first four books of my series, Janet and friends have stayed within day-trip distance of home, but who knows? There are so many stunning places in Indiana to hike with dogs and to photograph wildlife, they could find themselves almost anywhere in the future. What mysteries (or other novels) have introduced you to a new setting or given you new insights into one you thought you knew? 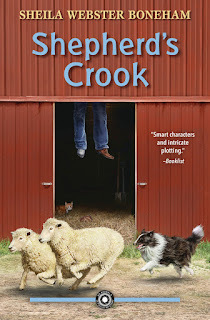 Animal photographer Janet MacPhail has just arrived at a sheep-herding competition with her Australian Shepherd, Jay, when she learns that a flock of sheep has disappeared. Police think the animals have wandered off in search of greener grass, but Janet sees and hears things that convince her the sheep's owners are right—the animals have been stolen. Janet knows she should leave the snooping to the police while she attends to her own problems—new living arrangements, her mom's wedding plans, puppy and kitten antics, and extremists bent on keeping people from having pets. But when a livestock handler turns up dead and the sheep's owner disappears, the police and a pair of thugs pay Janet way more attention than she likes. She sets out to find answers, putting herself and those she loves in the killer's crosshairs. Sheila Webster Boneham writes the Animals in Focus mystery series. Best-seller Drop Dead on Recall, the first in the series, was an NBC Petside Top Ten Dog book of 2012 and won the 2013 Maxwell Award for Fiction from the Dog Writers Association of America. The Moneybird was a Maxwell finalist in 2014. 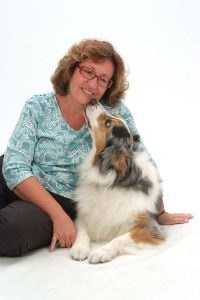 Sheila has been involved with many sides of the animal world and has written seventeen nonfiction books about dogs and cats, six of which have won major awards. You can find Sheila at sheilaboneham.com, or at her Writers & Other Animals blog at writersandotheranimals.blogspot.com, or on Facebook. Sheila’s books are available at all the usual places, and autographed copies can be ordered here. Tonka slipped this in...did someone say "Australian shepherds?" A heartfelt "thank you" to all veterans . . . . Mysteries that have introduced me to new settings? Julia's wonderful series set in Millers Kill in upstate New York and Archer Mayor's Joe Gunther series set in Vermont come immediately to mind. It's interesting how setting can play such an important part in the telling of a story. Now I'll have to check out the Fort Wayne "Animals in Focus" stories . . . .
My thanks and a job well done to the veterans who so bravely have served our country, including my husband. Sheila, I live in Kentucky right across the Ohio River from southern Indiana, and my daughter and her family live in Mt. Vernon, Indiana, an hour away to the northwest. Evansville is the Indiana city of size in the area. I'm in Indiana usually twice a week for the granddaughters. Mt. Vernon is on the Ohio River, too, but it also has access to the Wabash River, where my daughters in-laws have a cabin, and it is truly gorgeous. Right up the road from Mt. Vernon is New Harmony, Indiana, on the Wabash. In 1824, ten years after New Harmony was first built, a Welsh industrialist and social reformer named Robert Owen bought the town to create a utopian society. It only lasted two years as such, but there are many historical worthy connections that grew out of it. Just in case you want to explore the southern part of the state. I'm always looking for new settings to read about in my fiction reading. Scotland is one place that has become a favorite. One of the things I most enjoy about all of the Reds' books is the different settings I get to explore. London with Debs, Boston with Hank, New York in its earlier days and London in earlier days with Rhys, London (and various locations) during WWII with Susan, Key West with Lucy, the Adirondacks with Julia (my friend and I took a side trip through some of the Adirondacks on our way to Niagara Falls just because I'd read Julia's series), New York and Hollywood with Hallie. Setting is very important to me in a story, and you all do it so well. Speaking of Scotland, one of the reasons I started reading Peter May is because he made the Isle of Lewis come so alive in his Lewis trilogy. Louise Penny has mesmerized many of us with her Three Pines village in Quebec. Sheila, I'm looking forward to getting to know more about the Ft. Wayne area of Indiana through your series. And, the Aussie is an amazing dog. Lucy, I always love when you share about Tonka. After the passing of my dog last spring, my dog sitter is trying to talk me into getting a miniature Aussie, but I'm thinking it would need a lot more exercising or running room than I can give it. My dog was an Australian Cattle Dog, and was a sweet girl for 15 years. Even though I was born and raised here in Baltimore (and have lived here most of my life - except for 7 years in San Diego), I still learn something new about this city with every Laura Lippman book. She just has a knack for turning up tiny facts that are fascinating and she manages to include them in the book without distracting from the plot. Anyone looking for how to incorporate location into a book could certainly benefit from studying Laura Lippman's oeuvre. These are places I need to go... Thanks, Sheila, for such a great introduction. Settings from books... I have to go to the Upper Peninsula after reading Steve Hamilton. Of course the Adirondacks from Julia's novels. Venice from Donna Leon's novels. Paris from Cara Black's novels... Key West! From Lucy's. Kathy, I hope you'll "visit" Ft. Wayne through my books. So many people think of Indiana as the long stretch of interstate from the Ohio line to Chicago, which is too bad. Take an exit - there's so much more! And yes, the very southern part of the state is gorgeous, and very different culturally from northern and central Indiana. Thanks for stopping by! Joan, I agree - part of the magic of books is the chance they give us to visit places we may never get to in person - or they may inspire us to pack a bag and go! Thanks for stopping by. Kristopher, you're right, the setting can be one we think we know well, and then we learn more from books. I've learned more about Indiana and the Midwest (and beyond) doing the research for this series and other work. So much fun! Thanks for stopping by! Hallie, it's fun to visit vicariously, isn't it? And I have a long list of places I want to visit because of books. I also have a deeper appreciation of many places I have visited after reading well-drawn portraits of them in mysteries and other books. That is an adorable picture of Tonka! Thanks for an in-depth introduction to "your" state. I know that in spite of having been to a lot a states when traveling with my family on vacations, I didn't absorb nearly enough. Reading helps make up for that. A like being an armchair traveler. Wonderful post! I love reading about new settings and try to make them intriguing in my stories. What an adorable pooch! LOVE that. And lovely to "meet" a fellow Hoosier! I grew up in Zionsville, once achingly rural, now hip and chic. SO funny how our worlds change. The local airport changed too. The last time I deplaned in Indianapolis, I truly had a moment of worrying that I had-somehow--gone to the wrong city. They;d redone the entire airport--actually moved it! But I had no idea. Talk about going someplace new! I know I always talk about Winters Tale--but upstate New York has never been the same for me after I read that. Magical. So it's true, too, that going to a place after reading a book set there can change our perceptions! Happy Veteran's day and thanks to all our vets. I was in Fort Wayne for a taekwondo tournament a couple years ago. Did not have a lot of time to explore, but I do remember the parks and rivers. Sheila, I love your descriptions of the Indiana landscape and landmarks. But I want to know more about the dogs! I'm a huge fan of Susan Conant, and I'm always on the lookout for a good series that features dogs. And I'm very impressed that you won the Maxwell award! Lucy, I recognized Tonka before I read the caption:-) He's so gorgeous! Kathy Reel, I have a friend with two mini-Aussies. Maybe I should put you two in touch. Mary, maybe next time you're in Fort Wayne, you'll have a little time to explore. Thanks for stopping by! One of the reasons I enjoy reading the Red novels is because they transport me to a place I don't live, and I learn about them as I would any other character. Also, going to these settings is like taking a mini vacation! I even like reading stories set in my own town of San Francisco to see what an author might uncover that I don't already know. I'm looking forward to the new Molly Murphy, Rhys, to see how the 1906 earthquake impacts the story! Deborah, Susan is a long-time friend and inspiration (and thoroughly lovely person!). As for dogs (and cats and horses and...), I could write forever about them...oh wait! I do! The "protagdog" of my series is Jay, Janet's Aussie, who is based on my own lovely Jay (in the photo with me). He was born into my hands and was a kind, gentle soul. Janet's love interest, Tom, has Drake, a black Labrador Retriever, in the first three books, and brings home Winnie, a yellow Lab baby, in Shepherd's Crook. The Labs are based on my own three Labs, Raja, Annie, and Lily, although none of mine ever got into quite as much trouble as Winnie does! There are lots more dogs in the series, too, of many breeds and mixes - Maltese, Border Collie, Shetland Sheepdog, Poodle, Golden Retrievers.... But then that figures, since Janet involved with dogs as a professional photographer and as a dog-sport enthusiast. Thanks re. the Maxwell. For those who don't know, Maxwell Awards are given annually in various categories by the Dog Writers Assoc. of America. My books have actually won four Maxwells (1 for fiction, 3 for nonfiction) and been finalists 5 times; all three of my nonfiction books about cats have won MUSE Awards from the Cat Writers' Association. And last but not least, a heartfelt thanks to all our veterans, past and present. And any fan and friend of Susan Conant is a writer I want to read. Looking forward to your books! Debs, I'm thinking I might want to get a dog that is already potty trained when I get my next one. It's been so long since I had to go through that, and I'm not sure I want to again. I'd love to be in contact with you mini-Aussie friend. Sheila, I so agree about the beautiful eyes of an Aussie. Huskies also have gorgeous eyes. My husband says our next dog will be a hunting dog, as we've had an English Setter and a German Short-Hair Pointer before, and hubby goes quail hunting. I don't mind having a hunting dog again, but I suspect that I will have to eventually get my own dog again. Oh, and Sheila, I am looking forward to getting to know more about the northern part of Indiana. 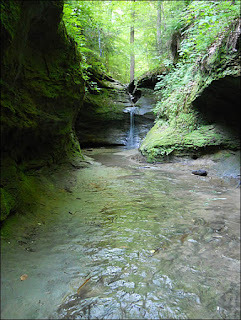 One place that I personally want to visit in the next year is Brown County and Nashville, Indiana. I have friends that do an annual Christmas time trip with all their family there. Sorry to be late getting here--we are on the road to Key West with cat and dog in tow. Tonka, who's 9, is bouncing off the walls after 3 days in the car. (Me too LOL.) Kathy I'm sure a mini would have a lot of energy, but a dog is a great way to push us out into the world when we might otherwise sit in front of the screen. Sheila, thanks so much for visiting the reds today--we are all looking forward to your books now! Kathy, Brown County and the area around Nashville is gorgeous country. I spent a lot of time there when I was in grad school at Indiana University, and when I lived in Bloomington again later. My very favorite spot is Yellowwood State Forest and lake.